to the Project Paris in springtime is the fabled city of a fabled season. This fascinating place and enchanting time were the setting for a June 15-18, 1980 conference on management education, the final phase of a historic cooperative effort between Americans and Europeans, the culmination of three years' work on an exciting project entitled "Management and Management Education in a World of Changing Expectations. " The project involved a look ahead at the thirty-year period from 1980 to 2010, the changes likely to occur during that time, and the implications for management and management education. Spon­ sored by the American Assembly of Collegiate Schools of Business (AACSB) and the European Foundation for Management Devel- xiii xiv INTRODUCTION ment (EFMD), it had two stages prior to the Paris conference - the first, a futures-oriented colloquium held in February 1979 at St. George's House, Windsor Castle, on "The Changing Expectations of Society"j the second, a colloquium held in November 1979 at Arden House, Columbia University, on "Management for the XXI Century. " 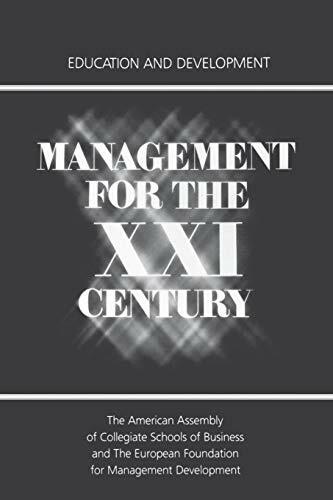 The theme of the Paris conference was "Managers for the XXI Century: Their Education and Development. " While spon­ sored by AACSB and EFMD, the Paris conference was actually a worldwide meeting, with corporate leaders and deans or directors of business schools throughout the world invited to participate. Representation came from all continents, with 650 participants from thirty-five countries.